Hello my friend! 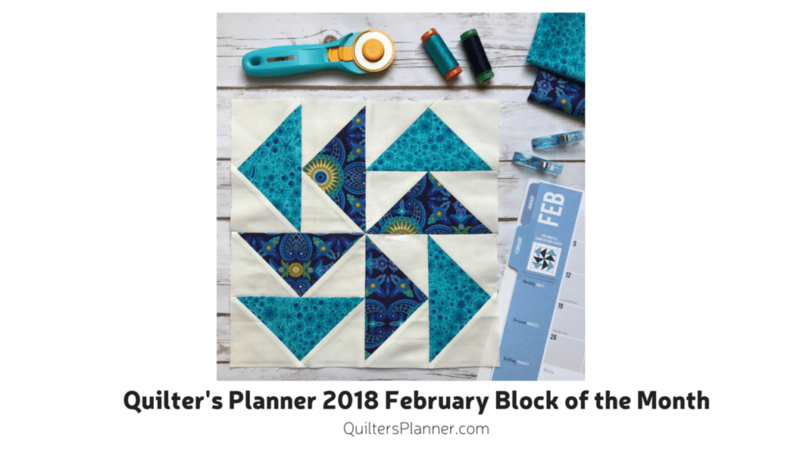 Welcome to the second month of the 2018 Quilter’s Planner Block of the Month Sampler Sew Along. 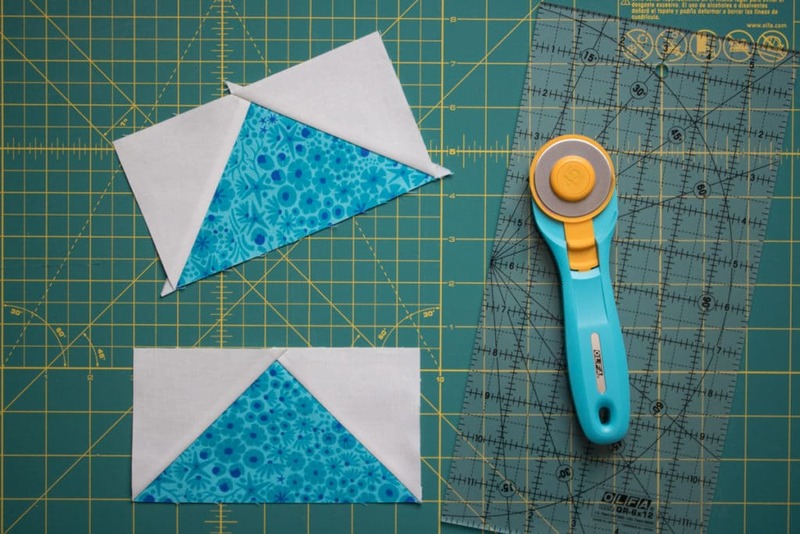 Don’t forget, if you have questions while you’re sewing, join our Facebook group! You can ask a question, and we’ll answer. Just be sure to put your question in a new post and tag @QuiltersPlanner. We are on Block 2 (page 28 in the 2018 Quilter’s Planner Magazine). Block 2 uses eight flying geese to make a pinwheel design. This is a classic design. Block 2 is made using the Four at a Time (No Waste) Flying Geese method. It’s a great way to make a bunch of flying geese quickly (as long as you want to have 4 that look the same). Although we do our best to catch all typos in the planner, there was a typo in our Four at a Time (No Waste) Flying Geese chart in the Reference section. We suggest that you download and print this corrected page, cut it out and tape it to your planner page (perhaps using your favorite washi tape!). Once you click the download it should open in your computer’s PDF viewer, and you can save and print it. For our Block 2, we used the following feature fabrics by Alison Glass for Andover: Kraken in Abyss and Reef in Mermaid from Diving Board. 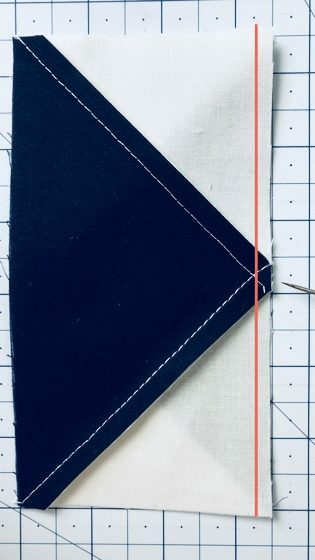 Before we get into some tips for making Block 2, just a quick reminder that we are using a scant ¼” seam allowance (a thread’s width less than a ¼”). It doesn’t sound like very much, but it starts to add up when you’ve got a lot of seams. 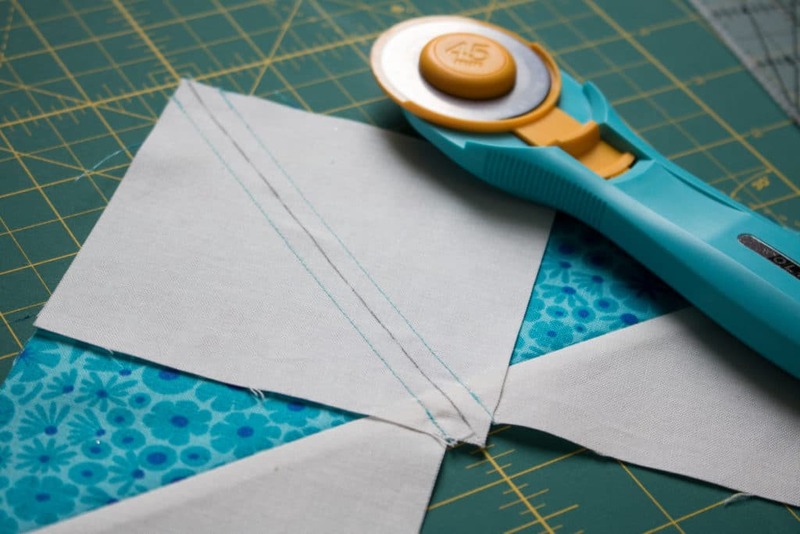 Remember to use a scant 1/4″ seam allowance when sewing your 4 At A Time Flying Geese! It will increase your accuracy. 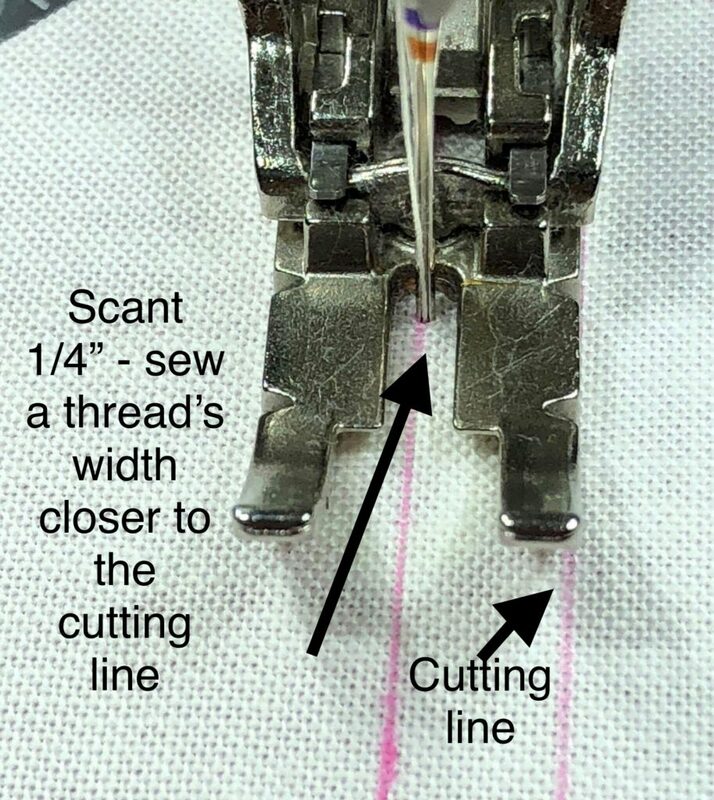 This photo illustrates what it means to sew a scant 1/4″ away from your center cutting line. 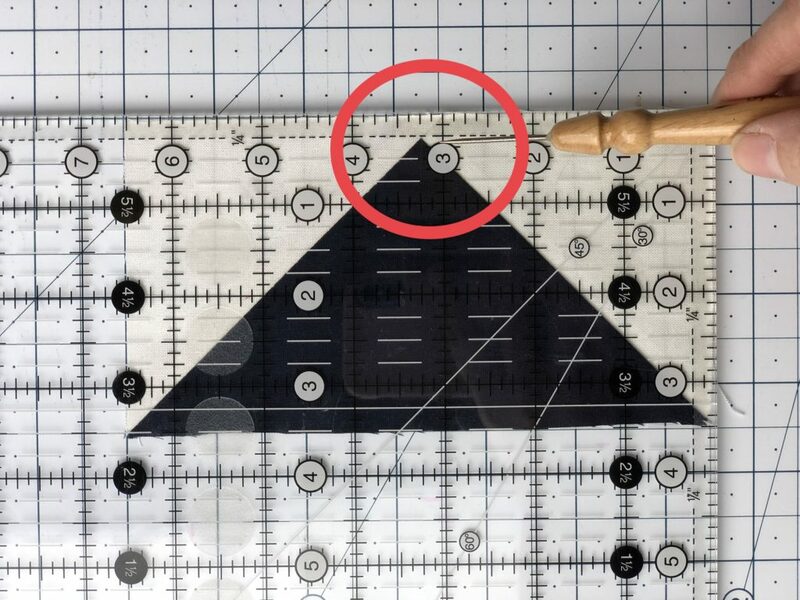 Instead of sewing on the dark lines in the photo, sew where the pink lines are. A) Before trimming, make sure that you have ¼” above the top point on your geese unit. A 1/4″ at the top of each flying geese unit will make it easy to sew your geese together without cutting off points. Also, make sure the tip of the triangle is centered at 3¼” (on a 3½” tall flying geese unit). 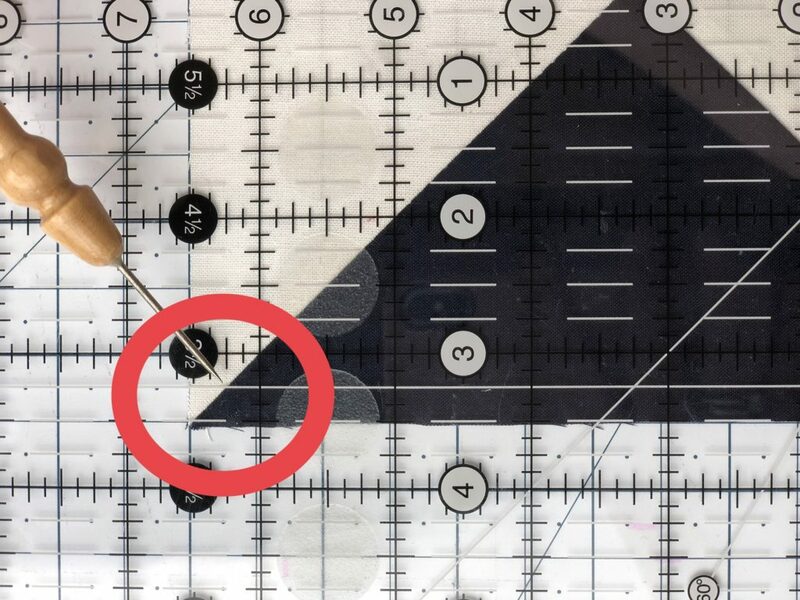 And align the diagonal seam on the left side of your flying geese unit with the 6 1/4″ mark on your ruler. Then you can trim. 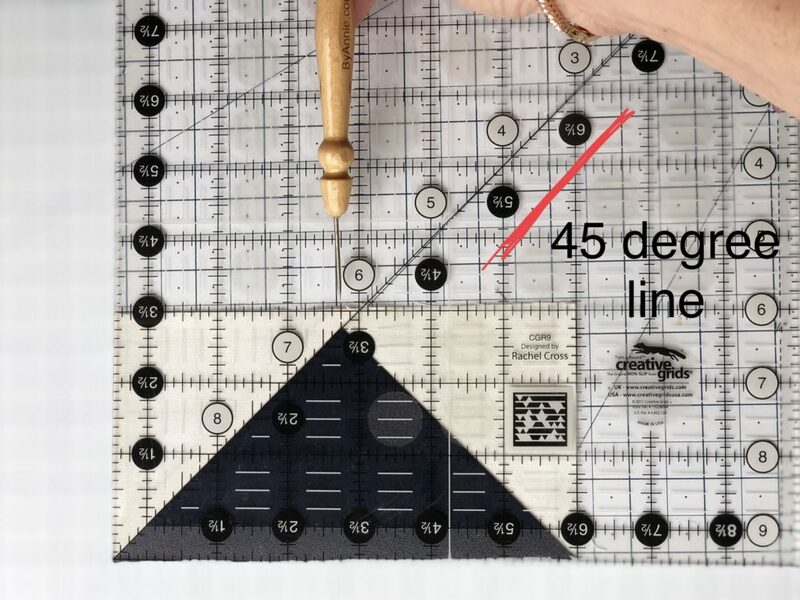 C) If you are using a square ruler, the 45 degree line is great to use. Align it where the feature fabric meets the background. 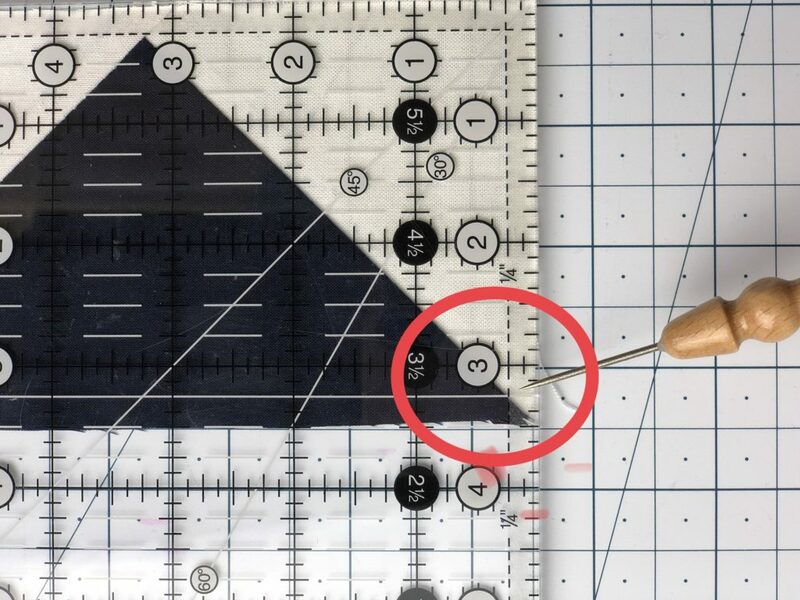 When sewing a pair of geese together (Block Assembly step 2), try sewing with the 2nd flying geese unit on top (shown in dark blue on the diagram). You will be able to see your previous lines of stitching so that you don’t sew through the top point of the block. Add your seam a hair to the right of the intersection (shown by the red line) and you will end up with perfect points every time! 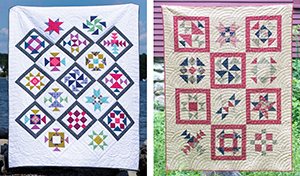 If you’ve chosen to follow the Modern Bliss layout, there are two versions of Block 2 in the quilt pictured on the cover of the magazine (1st row on the right and the 4th row middle). Feel free to make a second version of this block or choose another favorite later. Also, don’t forget that the Modern Bliss layout uses blocks set on point (rotated 45 degrees), so that may be something to consider when selecting fabrics. Between the 15th and the end of the month, sew up your block and post it to Instagram (please use the #QP2018sewalong hashtag) or to the Facebook Group (using the same #QP2018sewalong hashtag). We will have prizes for both, but you are only eligible to win the monthly prize once. Each month’s entry must be posted by 12:01am Central Time to be eligible.